Hi fans and friends of the Chronicles of Harriet website and its creator, Balogun Ojetade! This is not your funktastic captain speaking. This is the airship pirate, Crystal Connor. I have hijacked the Airship Sweet Chariot and Balogun is…unavailable at the moment, so I’m broadcasting today’s Butler / Banks Book Tour message. An entire year ago, I swore an oath of secrecy when I agreed to co-write a book with paranormal-romance author Lori Titus under the penname of Connor Titus. The reason, in the beginning, for the vow of silence was simply for the sake of peace. Now this is in no way meant to be a complaint, but my fans take their jobs seriously. It takes about a year for me to write a book, but just a month or two after announcing a new work-in-progress, that’s all my fans talk to me about, and writing is all they want me to do. For example, two weeks after the release of Book II: Artificial Light I was standing in line in Walgreen and asked the woman in front of me where she got her drop dead gorgeous shoes. When she turned to tell me, I was recognized, and she demanded to know why I wasn’t at home writing. Sadly she didn’t tell me where she got her shoes. If my fans had found out that I had teamed up with Lori their excitement would have been too much, especially because at the time we where both working on our own books which of course held more priority than a joint project, so we didn’t even know when this book would be finished. About a 3rd of the way into the project, “mum’s was the word” literally became a life saver, because we started to realize that we were going to be writing two books. And at that moment it stopped being about peace and immediately became a trade secret. We co-wrote, two, stand alone books about the same thing. We’d never heard of anyone doing that before and because it’s such an insanely original idea – or had been done which such infrequency that the concept isn’t widely known – we didn’t want anyone finding out what we were doing and beat us to the punch. Once the decision was made that this story was going to be told from two different points of view, we also made the decision to not only stop working together, but to also not talk to each other about what was written from that moment forth. I mean we went into complete radio silence; we didn’t even see each other’s cover until they were revealed earlier this month as part of our blog tour. We did this because we didn’t want to influence each other and, judging by the reviews, that turned out to be a really good move. After our books were shipped off to the editor, Lori and I decided to interview each other for our own blogs. Those interviews turned out to be a blast and that’s what I am going to share with you today. And yes, I am known as The Wordsmith…because that’s what I am. The Wordsmith: Ok, 1st off I need to get something off my chest. I heard through the grapevine that you prefer Pepsi over Coca~Cola. Is that true? Lori: Yes, I’m a Pepsi drinker. The Wordsmith: Oh hell no, this is a crime against the Crown. This interview is over, we’re not friends anymore. Lol I’m just kidding. Lori: LOL! But I drink Coke if I’m at a place and that’s what they’re selling. I still get the specific craving for Coca Cola now and again. The Wordsmith: Oh, okay …good save because I was about to send you straight to the gallows. I write straight up horror with a serving of science fiction and dark fantasy on the side. As a rising star in paranormal romance what was it that made you want to be a part of the Mt. Empyreal project? The Wordsmith: OMG that’s so true! I knew from the beginning that the story would have elements of romance but you do it really well so I wasn’t worried. That’s one of the things that interested me in co-authoring with you is seeing how we would build off each other’s strength. You also co-authored the novel Harmony’s Prophecy, with Angel Brown Kemph, which is now out of print, was it the same kind of writing process or was it totally different and if so why/how? Lori: The book with Angel was very different. She was the primary author. I worked on editing with her, and we had some sessions where we tossed around story building ideas, but it is her book. I was really pleased and surprised that she felt my efforts earned a co-author credit. The Wordsmith: Dude, how in the hell did we end up co-writing two books? Who does that? Lori: I think only we do, ha! It was a great idea that you came up with. We both got to have complete creative free reign. Whenever I read about authors who co-wrote together, I always hear about the constrictions placed upon the authors, and how one person ends up being the leader with the other being the follower. We were able to build our foundation for the stories together, and then throw the proverbial paint against the wall to see what would stick. The Wordsmith: I like that concept, that we both had creative free reign. The constrictions were something I knew I wanted to overcome before either of us wrote word one. It didn’t take long to see that we had two very different ideas of how this story should be told but I didn’t want to sacrifice one idea for the other and that’s what made me start thinking about doing something completely different. The funny thing is, I didn’t start researching ‘how to co-write a book’ until we we’re nearly done. Otherwise I don’t think I would have done it. LOL, speaking of horror stories in regard to co-writing, what was the hardest part about working with me? (Tell the truth). Lori: The hardest part was figuring out where we needed to split! I was enjoying watching the story unfold, and I was curious as to where you were going to take it. Once we did split, it took a week for me to get back into the story properly, because I missed being able to see what you had written and talk about our ideas together. The Wordsmith: OMG I was the exact same way. I was starting to think that splitting up wasn’t going to be a good idea. Thank God we didn’t chicken out of that decision lol. Was there anything that worried you about Mt. Empyreal? Lori: Yes! I was really concerned about which characters were going to make it, and who wasn’t. With a story like this one, there is a balance between making things so hard that it’s impossible for your characters to triumph, and making it too easy. You don’t want to make it so easy that the readers roll their eyes at how neatly things work out. That’s often a concern I have when I’m writing. Real life is messy, and I tend to like stories that reflect complexities in character and outcome. The Wordsmith: I know one of the things I was worried about and brought up often was I felt like I had unfairly taken charge and all the ideas were mine. I didn’t mean for it to be that way, I was just having so much fun that my excitement got the best of me. This was my 1st co authored book, so I guess my question would be, is this just the way things work when co-writing a book or was it really not an issue for you? Lori: It’s part of the beast – someone has to start, (The Wordsmith nods head) and you wrote a beginning that was so unique and chilling that I wanted to let you run with it. Once our start was firmly in place, I was able to see what I wanted to elaborate on and where I wanted things to go. That said, I don’t think that our writing partnership is like anyone else’s. While you were in the driver’s seat I was already planning. The Wordsmith: LOL, that’s the Virgo in you, I was thinking ahead when you were the one with the pen too. Which of the characters that we created together do you think will totally blow my mind? Lori: I always say Emerson; I love that character in ways that I could never have expected. We have talked about Khrystle before, and that she surprised you with some of the things she did in our shared copy of the book(s). Jerrod is also going to be a big surprise to you. Just you wait until you read it! The Wordsmith: I can’t wait to read it either, you have no idea how hard it’s been not to open the ARC copy you sent me to send to my reviewers. Wait…I don’t think I mentioned this, ok, so the reason Lori said she can’t wait until I read her book is because once we stopped working together we promised each other that we would not read each other’s books until our editor signed off on both books. And we didn’t even see each other’s covers until the 18th of April. Dudes, it’s been brutal. So far our reviews have been really good but every time a review for yours comes in it just amplifies my excitement. That’s it, I’m changing the subject! You have another book coming out soon, can you tell us a little more about that? Lori: lol. Bell House is a ghost story about a modern southern family with many skeletons in their past. At the forefront of the story are two half-sisters, Jenna and Diana, who share a contentious relationship. They were raised by different mothers, and most of what they believe about each other comes from things that they have been told by others, some of which may not be entirely true. After a tragedy in the family, Diana moves into a house willed to her by her father, and all sorts of trouble ensues. The Wordsmith: Just for fun. If you got the funding to take a year off to write where in the world would you live for that year and why? Lori: It could be Hawaii or Bora Bora, but I want to live somewhere on the ocean. I think it would be great to wake up every day with the ocean right outside, and take my laptop out onto the patio and write while I enjoyed my coffee. And of course I’d want a great big house where I could invite my friends to come out and stay for as long as they want. That would be great. The Wordsmith: Dude for as long as they want, by the beach, in Bora Bora? And you expect to actually get any work done? Yeah ok.
We were lucky enough to have our forward written for us by Jaime A. Geraldi from, wait for it…..RT Book Review Magazine! (screams, swoons, and faints) But 1st let’s set the mood with the book trailer! The dynamic duo known as Connor Titus have merged together to create a story that will chill you to the bone. Each adds a dark and distinctive quality to this compelling read and it’s almost impossible to favor one over the other as the ink bleeds upon the page for everyone to witness. 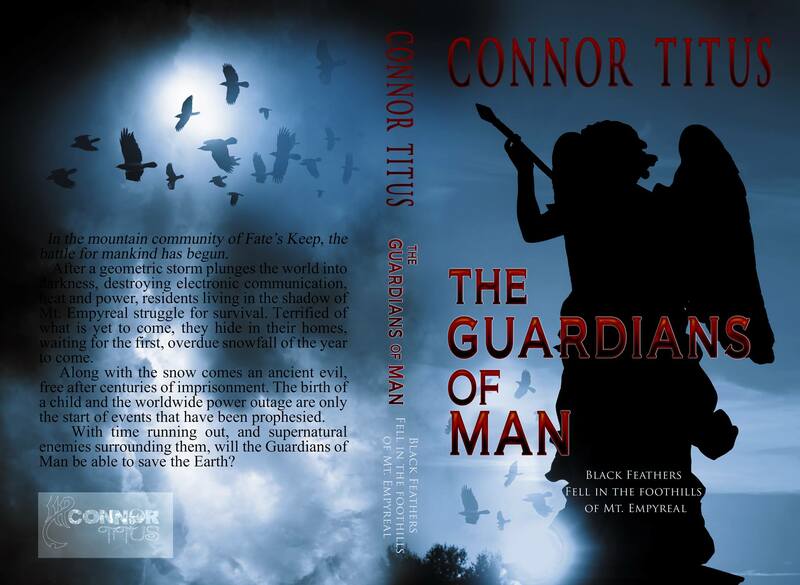 Connor’s interpretation is fierce and grabs readers by the throat as they gasp for breath once Old Man Winter strolls in and they’re left powerless. She allows you to visualize the characters movements and endure their emotions without flaw. The highly descriptive settings throughout will make one feel as if they’re part of the story which makes her rendition realistic and absolutely terrifying. Titus’ version captivates one by taking hold of their mind first before they even know what hit them. Then the emotional setback follows. 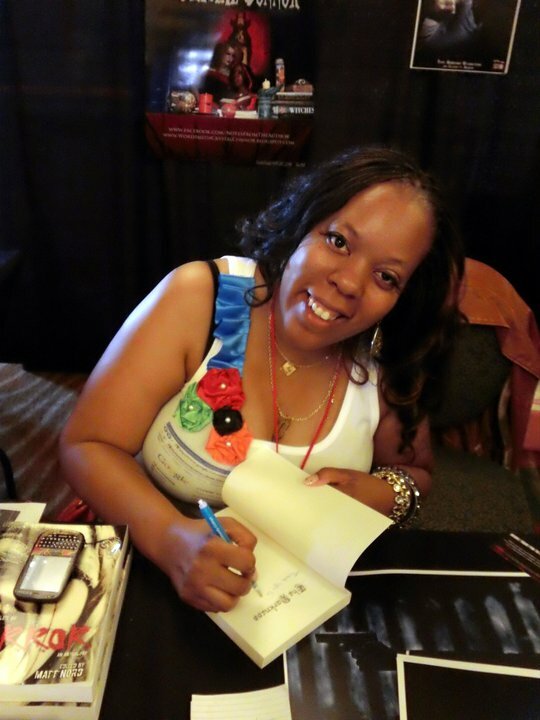 Her gifted storytelling ability will have you thinking you’re reading just a novel, but your brain may tell you something different as you actually may experience bouts of terror or feel perspiration at your brow. Each author singularly has the ability to lure you into the book quickly, but as a pair it may feel as if they’ll never let you leave. Ladies and gentlemen, welcome to Mt. Empyreal. Thank you so much for letting me take over your blog for today, Balogun – not that I gave you a choice. And thank you, fair readers, for hanging out with The Wordsmith. 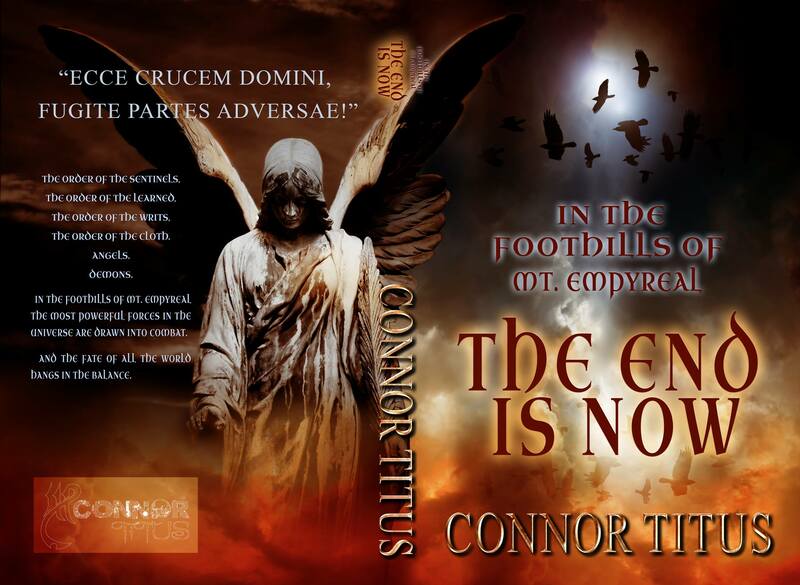 And to follow us on our blog tour as we promote both books please click here: http://junipergrovebooksolutions.com/foothills-mt-empyreal-connor-titus/. If you follow us, be sure to enter for a chance to win a signed copy of both books, a promo T from each of us plus a signed copy of The Darkness along with a signed copy of Ryder. Posted by Balogun on April 29, 2014 in Afrofuturism, Dark Fantasy, Horror, Speculative Fiction, Supernatural and tagged connor titus, crystal connor, horror. Thanks Sir Balogun for letting me take over your blog today! This tour was so fun, added so many kickass books to my wish list. Thanks for this! This sounds amazing. I definitely will have to take a look in the future. So many great books in this tour. Thanks! I definitely increased my list greatly during and after this tour!